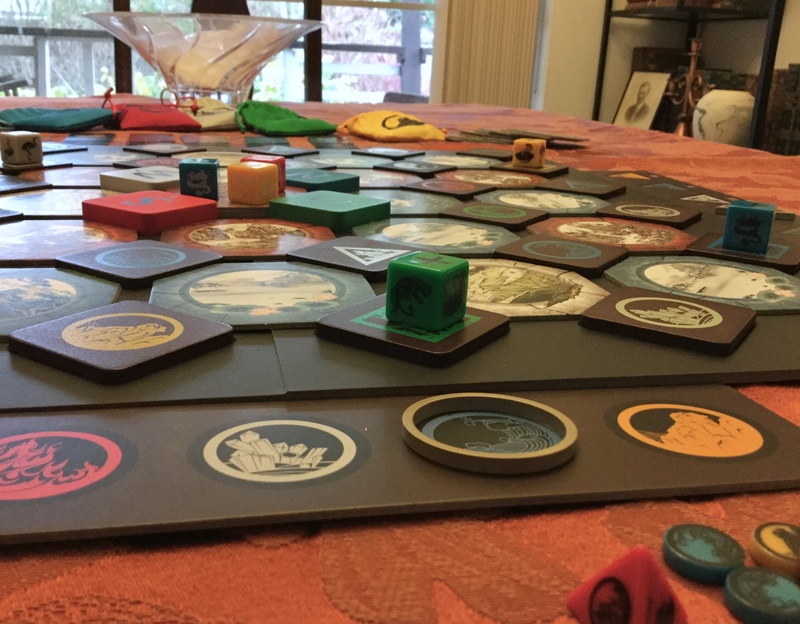 First to arrive, this season, is Wu Wei: Journey of the Changing Path, from Gray Wolf Games. It had both an interesting set of mechanisms and a deep thematic content. The fact that it’s also bloody gorgeous and of the highest production quality, well, that’s gravy. Wu Wei is a token movement game. You move your token about the board in a manner that is (hopefully) most efficient and leads you first toward your goal. You are a “student” and must visit each of five “masters” before you and your specific master can return to the center of the board (and thus win the game). Simple in concept, easy to learn, Wu Wei is strategically complex, as other players can block your student’s path either passively (by just being in the way) or actively (by building obstacles that persist after they have moved on). Students gather “chi” as they move around the board, small markers that denote life force attuned with natural elements. Chi may be expended to overcome or avoid obstacles. It’s easy to gather chi, but to expend chi it must be the right kind of chi, attuned to the element that is ascendant at that moment, so planning is crucial in this, as well as in movement. The game has several modes of play, which gives it great flexibility and a high replayability factor. The basic game (Initiate Level) is for 2–5 players and concentrates only on the basic four phases of a players turn: Meditation, Movement, Alignment, and Discipline. By adding additional rules and concepts, players can advance to the Master Level (2–5 players), and then to the Emperor Level (3–6 players). Add to this two modes for Solo play, Scenario and Campaign, which give more opportunities for play and learning, as each scenario also has beginner, intermediate, and advanced options. Thematically, Wu Wei is steeped in Taoism, a philosophy of balance, oneness, growth, and harmony. You see this not only in the artwork and the sidebar info boxes scattered through the rule book, but also in actual gameplay (a rarity in my experience) where you really have to look for the harmonious path, the path with the least imbalance, to efficiently achieve your goals. There is no combat in Wu Wei, and no conflict, per se, beyond building obstacles to thwart an opponent’s progress (be careful; those obstacles can be in your way too, if you’re not careful). Balancing chi, balancing the yin/yang, are critical to success here, especially beyond the Initiate Level of play, and keeping the philosophy of Tao top-of-mind actually helps you see the way forward. And then there’s the quality of the product. The board itself is extra thick, and this is to accommodate the recessed square niches into which tiles are placed. These tiles are thick plastic and themselves act as holders for the larger, octagonal “season” tiles. This system of niches and thick tiles allows the board to “lock” in place, which is very helpful if you happen to have cats that like to inspect the game board from time to time. I’ve provided a low-angle view (right) so you can see what I mean here. There is nothing chintzy about this game. It’s all just top-notch production values, from the beautiful artwork to the high-quality board and tokens. The play itself is interesting, challenging, and has varying levels of complexity, making it a game you can come back to time and time again. And it incorporates the theme so fully that it affects how the game is best played. Wu Wei: Journey of the Changing Path, can be purchased directly from Gray Wolf Games for $69.